Get a replacement spa blower online whether you need a 1HP, 1 1/2HP or 2HP blower. Before replacing a blower, be sure the old blower does not have water in it, or you may have the same problem with the new blower. Generally, there are 2 lines of defense when it comes to avoiding water getting into the spa blower. First, there is a Hartford loop which is a 180 degree spa plumbing setup with the piping/hose going very high – ideally above the water line and mounted under the spa cabinet, attached to the rest of the plumbing. After the loop, there is also an air check valve in the plumbing before it hooks up to the blower. This is another safety mechanism to prevent water from getting into the blower. If the check valve has failed, it will need to be replaced before replacing the blower. Spa blower cords come with different connectors. The most popular types are the 4 pin AMP cord (usually white) and the mini-J&J connectors or Gecko In.Link connectors. Another thing to watch when replacing a blower is whether it is a 120v or 230v blower. Blowers are fairly easy to replace. They plug into the circuit board or spa pack directly. They are usually screwed down to the spa floor, a mounting block or even an upright post with the air exhaust facing down. The connection is often 1 1/2 inch air hose. Some spa companies such as QCA Spas use the blower to force air into the venturi ports of the water jets. This creates a turbo effect where the air from the blower assists the water jets and creates a volcanic eruption inside the spa. Some aromatherapy systems also use the blower air to introduce fragrance into the air injectors in the spa. 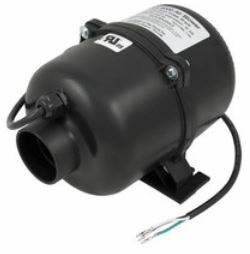 Find the right replacement hot tub blower online at Hot Tub Outpost U.S.A.